This question is usually asked by interviewer to understand what you are capable of and what makes you to be proud of your work. The answer requires tangible examples and evidence of your achievements. Make sure it’s one you’re passionate about. Highlight the specific accomplishments. The accomplishment that you choose to describe also gives the interviewer a sense of your background, values and interests. 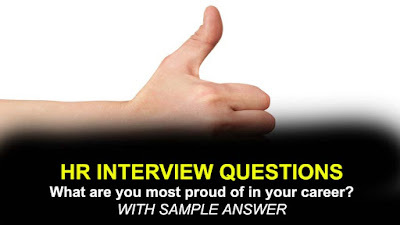 Your interviewer will also be looking for an answer detailing the process of how you accomplished. So, prepare a good response and example to backup your answer. Try to make a story rather than delivering a short answer. You should lead the interview from how this accomplishment materialized through the end result and then why you are proud of it. But remember, You can only answer this question with one achievement. The way you answer this question shows what you value, where you find satisfaction and can let them know if you will be a good fit in their company. Many companies look for self-motivated individuals who will push themselves towards success rather than need to be pushed. So, try not to focus on an achievement that has little relevance to the job that you are applying for. Whatever it is, it's important that you demonstrate the high standards you set for yourself. Therefore, focus on an incident where you solved a problem for a previous employer or made a significant contribution in some way. - Highlight all the accomplishments. - Talk about your character traits or your skill set that enabled you to achieve success and tie them back to the job. - Prepare a good response and example to backup your answer. - You can only answer this question with one achievement. - Discuss what you did after this moment of success. - Try to bring up skills and traits that you have that would help you do the job. - Don’t mention personal stories, but don’t limit your response purely to work achievements. - Describe the practical skills that enabled you to succeed. - Tell your stories in positive ways to help the hiring manager see the best side of you. Answer : At my last position, I was able to implement a new software system in my previous company, which is now used by over thousands of employees. Initially, I collect all the informations and build out detailed system requirements by working with users in each department to understand how their processes work. Then I assemble a team within the organization who assisted in the evaluation of the software vendor. After refining the business processes, the first software buildout. After completing three CRP’s and multiple configurations made to the application, the system was tested by the users and got 5 star rating, thereby the new system was succesfully launched in the company. The new system was capable of doing what management needs it to do the day it goes live.. This allowed me to practice planning a large-scale project and motivating a sizable group of employees. This is one of the tough achievement which makes me proud of.